A team of talented youngsters from Copeland engineered themselves a place in the finals of a prestigious international competition. 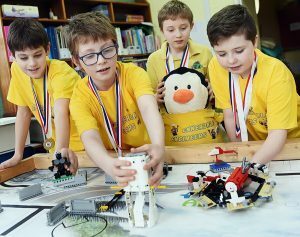 Ennerdale Engineers, a team of 10 pupils from Ennerdale and Kinniside Primary School, were runners-up in the LEGO League regional finals for North and West. 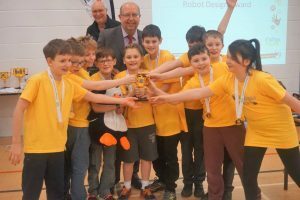 They then competed in the national finals where pupils fought off competition from secondary schools across the UK to win the second-place trophy in the Robot Performance Award. The First LEGO League is a global robotics challenge aimed at 9-16 year olds, where pupils are tasked to solve real life problems with the help of a LEGO robot. The programme helps pupils understand the principles of computer science, as well as developing skills such as communication. £4,250 from the Live the Dream Fund helped take the schools team to the five-day international final in Bath last year, where over 90 teams from across the world took part. Headteacher David Moore, said: “Attending the finals was a stunning achievement for any team, but even more so for Ennerdale who had both the youngest team members and were from the smallest school in the UK final. “Engineering firms in West Cumbria are one of the largest employers of high quality jobs. Success in this field can greatly increase a child’s future economic wellbeing.